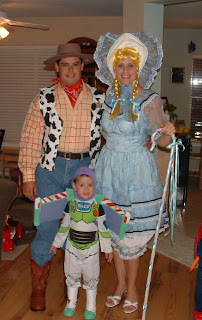 The World According to Shannon: The death of the family costume? The death of the family costume? That is until your precious son discovers his love of Buzz and Woody. I can't blame him, what an awesome movie. I hand painted his wings and boots thank you very much. The inflatable ones (wings) just weren't working for me. He was jumping off of the furniture for weeks. Then came Miss Thing. 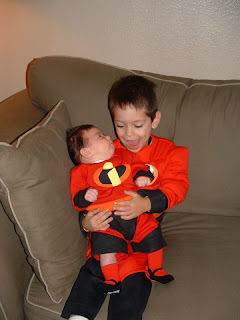 I wondered if I would regret not dressing her up as something froofy for her first Halloween (she was less than a month old then) but Super Son had at this point discovered The Incredibles. His baby Jack Jack doll had endured the diaper practice of preparing for baby sister's arrival so why not let her do the real thing. They were so cute. 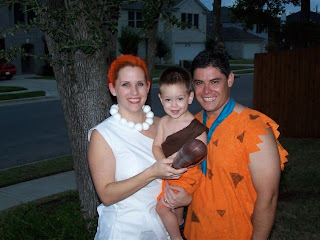 I was still recovering from her birth (oy vey) and Eddie didn't enforce my family costume rule so rigorously. I got to go as Lois Lane to his superman. Lord that Helen Parr / Mrs. Incredible spandex costume would have been a mean thing to do to me then. And yes, I hand painted Miss Thing's costume onto a baby sweatsuit. I told you I love Halloween. Then came the year of Superman. This time it was Super Son. He had been obsessed with Krypto the superdog and of course when Miss Thing heard the Supergirl suggestion she was in. 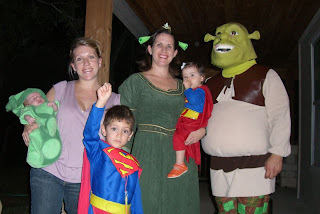 Hero Husband and I had done it last year so we opted for Shrek & Fiona, but don't think I didn't try to convince the kids to go as Donkey & Puss-in-boots. Last year Super Son was a complete space nut. Miss Thing didn't care too much and was getting her fairy princess dressup fix from the dress up box at home so when Super Son suggested that they be Astronauts she was game and in true Miss Thing fashion wanted to do what Super Son was doing. 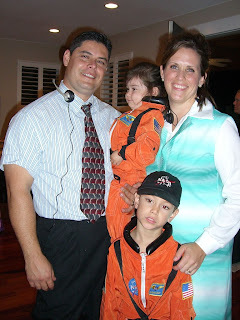 I couldn't figure anything to go with Astronauts so Hero Husband and I were mission controllers. Vintage dress, headset and pocket protector filled out the ensemble and we rocked the party. Hero Husband and I even had nametags for Mr. & Mrs. Gorsky Don't let the look on Super Son's face trick you he just hated standing still for the photo. I could start sewing right now except that every time I raise the issue I hear (whining) WallE, Diego, Star Wars. Star Wars, seriously, they haven't even seen Star Wars. Diego. Come on please cut me some slack. We watch Go Diego Go EVERY DAY OF THE WEEK. I am not exaggerating here. Every Day...and I am throwing a Diego Animal Rescue Adventure birthday party for Miss Thing where the kids actually go rescuing for their own (stuffed) animal! Must I dress up like Diego's mother too? Let me be Glenda, heck I would even take Auntie Em at this point! But I feel like the WWotW because I am the mom and I am not letting them pick their "own costumes". Even though I am giving choices that have some mass appeal to both boys and girls (fairies & pirates anyone) and letting them choose who within the group they want to be. They continue to cross their eyes at me and moan about how the catalog has so many other things to choose from. *disclaimer* Hero Husband was never officially excited about the donning of any of these costumes (except maybe superman) He does it only for love of me and his "Man Card" should under no circumstances be confiscated as a result of what he does for love of me and Halloween fun. Will you adopt me for the night? I lived in Kansas for years and years I could be any of the characters. I used to dress up just to answer the doorbell but no one comes to THIS neighborhood here in TX. I was the one in PA who set up the treaters with surprises at doorbell ringing time. I scared one or two little kids a little *too* much. HA.